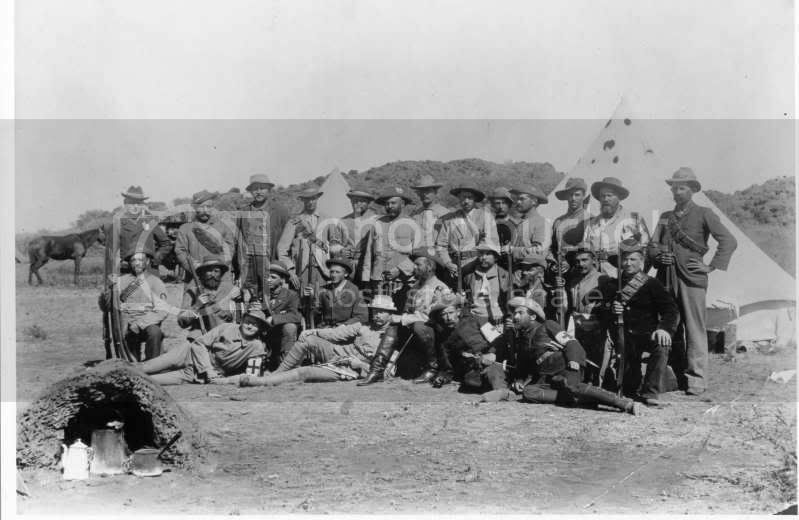 The photo below was taken outsidfe Kimberley in late 1899 during the Boer siege of the diamond city. It shows Major FWR Albrect of the Free State Artillery Corps (seated with beard, khaki tunic and lionhead sword) as well as a number of German volunteers that did service with the artillery corps like Otto von Losberg, Prof. AF Hochapfel, R Hochapfel, Von Dewitz, Von Heister and Augustine. The swords are all WK&C artillery officer's lion head swords. Can anyone identify the bayonet worn by the medical orderly R Hochapfel laying in front of the photo? Das Foto ist leider zu klein, um Genaues zu erkennen. Welkom by die forum, Snaphaan. Die foto is ongelukkig te klein is om op te spoor sekere.